Fractured and slumping rim of Klute W crater. Image is 900 meters wide, LROC NAC M143201144RE. The relatively fresh farside highlands impact crater Klute W (38.2°N, 143.0°W) offers lessons on the behavior of landslides in lunar gravity. The upper portion of the opening image highlights the southeast interior wall of Klute W, and slopes downward toward the NNW (crater interior). 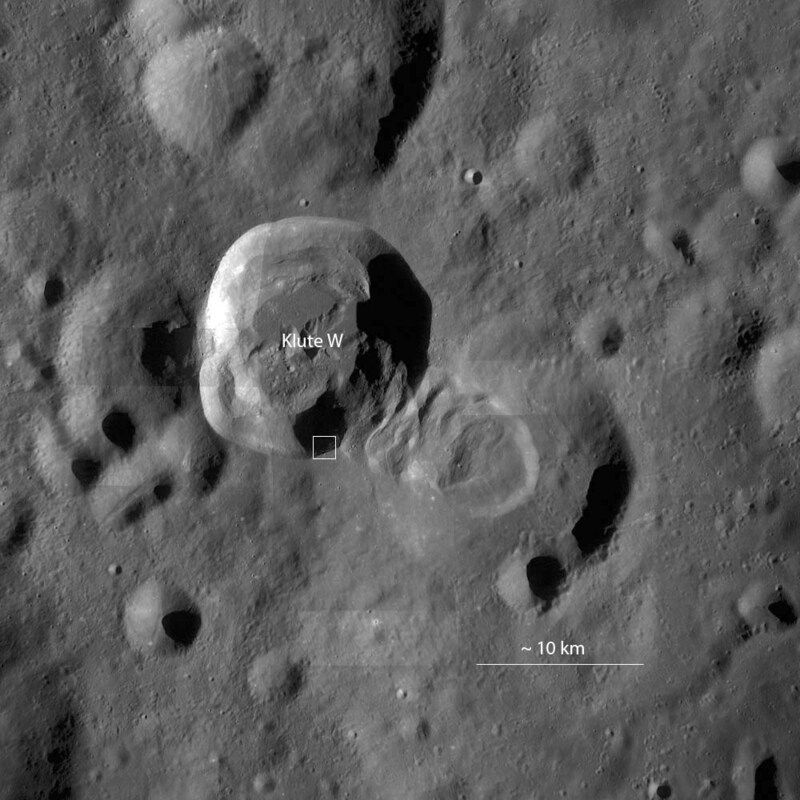 The lower, heavily cratered portion of this image is outside the crater wall along the rim. The crater rim is degrading due to 'slope retreat' as portions of the surrounding rim fracture, break free, and slump down the wall. Some of this fracturing and slumping may be influenced by nearby small impacts. Due to this slumping, small craters on the rim were torn apart. Each time the rim fails and slumps downward, the crater diameter increases slightly, showing one way that craters are modified after their initial, violent formation. A few small craters are superposed on top of the slumped material, but not as many as on the surrounding surface. One could logically infer that the slumped material is significantly younger than the rim. However, the slumped material is likely less compacted, and prone to downward movement, as small craters are formed - thus small craters have only a short lifetime on the steep walls.